Unlikely Zimbabwe figured in our tour group’s itinerary because the PAF had been training its under-manned and inadequately trained air force for many years and, it was felt that a goodwill tour could help keep the deal well-oiled. (Thirty years from the time it started, the PAF continues to maintain a respectable presence in sub-Saharan Africa.) Fruitful parleys at the AFZ headquarters in the capital Harare, and a visit to the Thornhill air base at Gweru – where my friend Nauman Farrukh hosted a sumptuous lunch at his palatial villa – were the highlights of our official visit. The side show of the tour was a welcome trip to two great natural wonders of Africa. We took a commuter flight from Harare to Victoria Falls, where a small airport of the same name receives hordes of tourists, who spend tranquil holidays in cottages just outside the beautiful Victoria Falls National Park. An unusual sight that we noted at both airports, as well as ticket counters and eateries – with some wonderment, I may add – was the strict habit of queuing amongst the locals. Not that the country is a police state in the sense that Whitehall or White House would have us believe, nor is compulsory military service in vogue, but thorough discipline was evident in everyday lives. We were to note more of this deference to law and authority on the roads, where the traffic was most orderly and everyone stopped on red traffic lights, irrespective of the time of the day or night, whether a cyclist or a truck driver. I wondered to myself if the West had got it all wrong about Zimbabwe. Perhaps, the country’s independent ways have rankled the West, especially its former colonial masters, who have left no opportunity to harangue its leader, President Robert Mugabe, who somehow soldiers on into his 32nd year of rule. 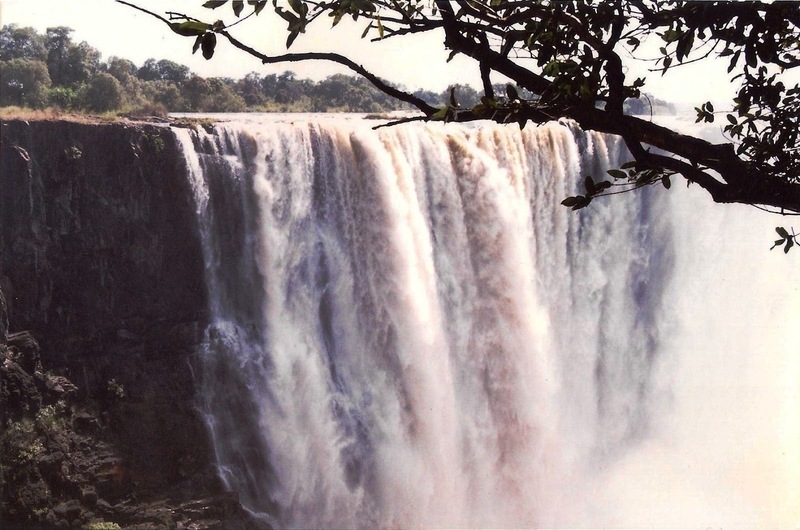 It is a shame that despite better tourist facilities at Victoria Falls, Westerners prefer neighbouring Zambia, perhaps out of spite for Mugabe. After landing at the airport, a twenty-minute drive saw us at the gates of the park, from where a short walk took us to the best vantage point for viewing the waterfalls. On the way, we saw a most moving sight: a very old man on a wheel chair was being gently moved by locals, while his equally old wife was pacing slowly beside him, with a walking stick in her frail wrinkled hands. Our curious stares got the old lady explaining on her own that her 90-year old husband always wanted to see the falls in his life-time. “I am so happy that we have been able to make it. We came all the way from England, you see. You can’t imagine his feelings; only I know”. It was hard not to get misty-eyed at the sight of the lady adoring her husband with such tenderness. Zambezi River was in full flood in the month of March. The fury of its torrent showed in a fantastic wall of spray that rose over a thousand feet in the air, as millions of tons of water fell crushingly, more than three hundred feet on to the basaltic rock below. Adjectives and exclamations flowed copiously out of gaping jaws, as everyone seemed entranced by the breathtaking sight and thundering sound. Cameras clicked frantically as if the scene was a fleeting one, though Nature had been at work for millennia and, still going mightily! Waterfalls are usually classified by width, height or flow rate. Victoria Falls are neither the highest, nor the widest, these two titles going to Angel Falls in Venezuela and Iguaza Falls in Brazil/Argentina respectively. Victoria Falls, however, register a discharge of the largest volume of water in the peak of rainy season, though Niagara Falls comes on top when averaged over a complete year. I thought whatever superlative title the waterfalls held, it was a pity that Zimbabwe could not extract its full benefit, hopeless as things are politically and economically. In a Western country, tourist sites such as these would earn enough to alleviate the woes faced by the Harare government. Having spent over two hours at the falls, we decided to wind up the sightseeing as we had to catch a tourist boat that was scheduled to depart shortly from a nearby jetty. 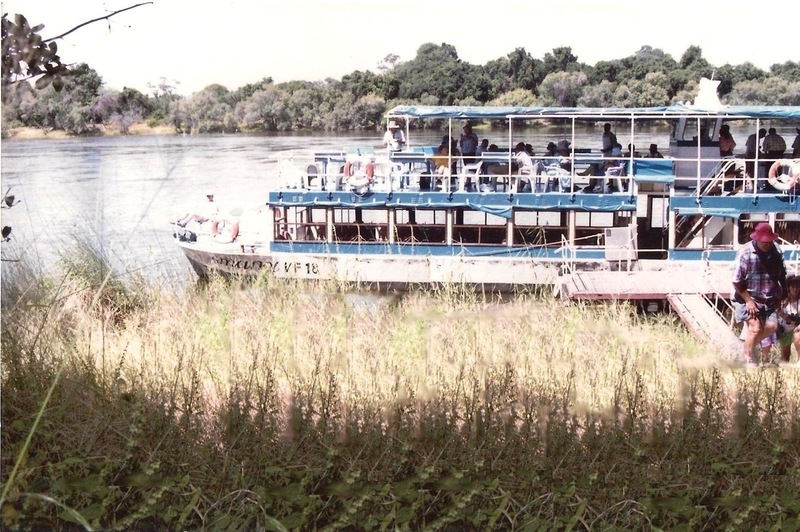 Much excited as we were, we looked forward to the cruise on one of Africa’s great waterways, the Zambezi River. Walking out of the park, we stumbled upon what is known as the Big Tree, a huge baobab tree (Adansonia digitata) said to date back several hundred years. Nearby, the old couple we had met an hour earlier had not covered much ground, though they seemed quite determined to carry on. We wished them good luck and the old lady mumbled some blessings like our own grannies do. At the jetty, we found ourselves in a tropical jungle, having to weave through tall grass and thick foliage till we got to a rickety gangway. The Amami, a triple-decker boat with rather spartan furniture and no other trappings, was bobbing by the quay-side. We joined a crowd of tourists, most of whom were locals. Everyone was happily toting a can of Zambezi beer, the Zimbabweans’ favourite pick-me-up drink. Quite punctually, the motors of the boat powered up and off we went slicing the swollen Zambezi, fresh on the heels of a cruise – complete with a variety show – that we had taken a week before, on the Nile in Egypt. Zambezi River has a primal charm all its own, with dense foliage covering its banks. Besides common reeds and papyrus, there is a profusion of ‘sausage’ trees (Kigelia pinnata) whose large sausage-shaped seed pods can often be seen floating on the waters. Crocodiles are known to bask on the sandbanks, as the warning signs indicated. The well-dressed captain of the boat – most Zimbabweans are well turned-out, we agreeably noted – rattled a commentary for those who were keen to listen, and included a concise lesson on African geography. We learnt that Zambezi River originates in neighbouring Zambia, passes through a portion of Angola and re-enters Zambia; thereafter, it demarcates a bit of the border with Namibia, a speck with Botswana and the whole of it with Zimbabwe. Finally, it snakes across Mozambique to discharge into the Indian Ocean. Following the discourse in academics, the captain challenged the passengers to a spot-the-hippo game. Suddenly, a cheer went up when a hippopotamus was spotted in the river, then another. False sightings, however, outdid the real ones by a large margin! After the hour-long cruise was over, we decided to visit the nearby Victoria Falls Bridge, which carries a railway line that was originally intended to connect Cape Town with Cairo. The ambitious project never went the distance, though it continues to serve as a rail link between Zambia and Zimbabwe. Built in 1905, the 400-ft high bridge is nowadays more famous for bungee jumping, as rail service becomes irregular due to the need for constant repairs to the bridge. Tempting though it was, a jump would have required crossing over to the Zambian side after obtaining a day-pass at the border post. We had to get back to Harare in time for a reception at the Pakistani High Commission (now an Embassy), to celebrate Pakistan Day, so the jump had to wait for another time. 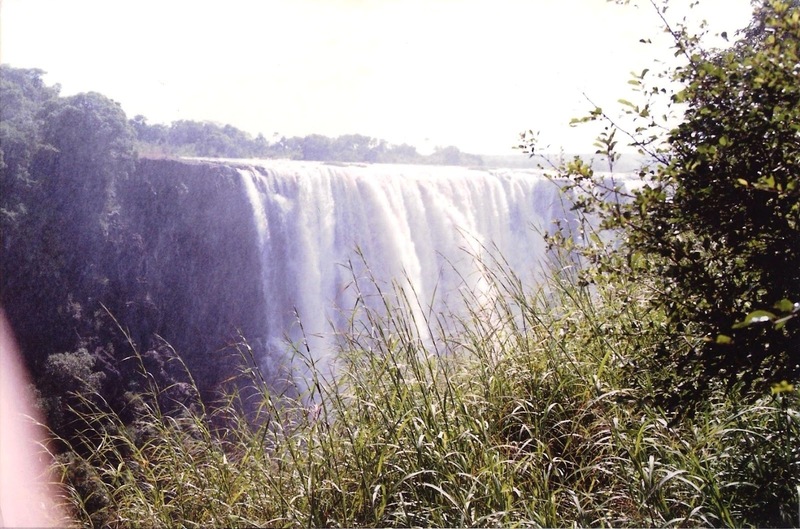 As we flew back to Harare, I wondered whether Livingstone’s description of the waterfalls ‘having been gazed upon by angels’ was more apt, or the locals’ appellation, ‘the smoke that thunders’. Having read an odd name at the entrance to the park, I settled for Mosi-oa-Tunya, which seems to tingle both senses in a strange way, even if one doesn’t know the Shona language. It means nothing else but …. The Smoke that Thunders! This article was published in the daily newspaper The News International on 25 March 2012.